The design of the normal passenger-carrying Nihola represents an interesting set of tradeoffs between internal volume and the space it needs. Consider the barriers that guard the entrances to many a bike path in Oslo and Copenhagen. Often enough a series of rocks are used, set just over 90cm apart, which is fine for a Nihola. A more advanced solution is an offset pair of metal gates, fences, or concrete blocks. 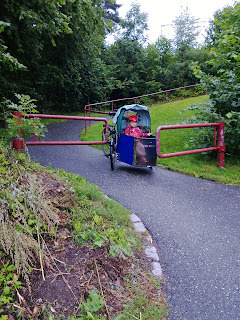 There is generally not a straight path through, so to pass between them and onto the path, generally a cyclist (or baby-wagon-pusher) needs to zig-zag. Today I took a pictures of my Nihola navigating between one of them near where I live. This one leaves no more than a couple centimeters of clearance between the right tire and the front corner on the way down, and just before starting this turn, it is necessary to be within a few centimeters of the fence with the left tire. (Uphill is easier because its possible to put the left tire onto the plants before turning between the gates.) This is not an unusual situation. An unusual situation is either: 1) having room to spare or 2) not having enough room at all. This is true in both Copenhagen in Oslo. Must be some kind of standard. The special Oslo wrinkle on this is that the two of these nearest where I live are both on steep hill sections. There is another one of these a few km away that I can only navigate with the perfect approach angle, and only if I don't have pannier bags installed. The clearance is that tight. On the positive side, it is easy to turn a Nihola by lifting the back (so long as there isn't something heavy on the cargo rack). The interesting thing here is that if the Nihola had a square box of the same length and width, it wouldn't fit. In many gates, the strangely rounded shape is essential. But what about other types of cargo carriers? I can only speculate: the long cargo bikes have a problem with length and turning behavior but are narrower, the box trikes rotate the whole box, which is probably helpful for tucking in those corners. Also interesting is the doorway pass-ability of a Nihola. It seems that standard doorways can be navigated with just a small bit of steering of the tires. Its easiest to pull the Nihola forwards through tight doors in my experience.